Tomorrow I am planning on posting the next entry in my brewery overview series featuring Pretty Things Beer and Ale Project. I had no problem choosing which beer I would review for my lead in article. When I made the transition from chugging Natty Light at a Bowdoin campus-wide party to enjoying flavorful craft beer there were some styles that I enjoyed immediately and others that required more time. Pale ales, IPAs, porters and stouts were all immediate favorites, but at first I didn’t really like Belgian style beers. The fruity and spicy esters gave these beers a much different flavor profile from what I was used to, and my first experiences weren’t great. I spent years insisting that I didn’t like Belgian beers. 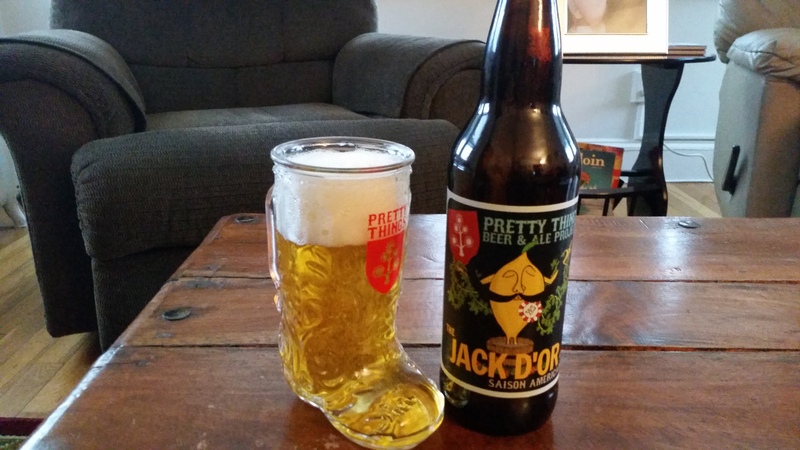 Later on, after moving to Boston, I began reading the old 99 Bottles blog on Boston.com, and Steve Greenlee routinely sang the praises of the upstart local brewery named Pretty Things Beer and Ale Project, in particular their flagship saison Jack D’Or. That blog had introduced me to numerous great beers, so I gave Jack D’Or a try and it completely changed my opinion of Belgian beers. Saisons are now one of my favorite styles of beer and Jack D’Or is a huge reason why. Pretty Things brews Jack D’Or with a diverse set of ingredients including wheat, oats, rye and 4 varieties of hops. It is available year round on draft and in 22 oz. bombers. Pretty Things Jack D’Or pours straw yellow with a solid white head. The scent is a complex mixture of spicy Belgian style yeast, floral hops and a little light malt. The yeast leads the flavor, notes of green apple, coriander, white pepper and apricot. There is also a substantial hop profile, more than many saisons, with touches of cut grass, lemon and forest floor with a hit of bitterness. There is also noticeable malt body in this saison, crackers and toast along with spicy rye and wheat. There are a number of complex and diverse flavors mingling in this beer but it all fits together seamlessly. Pretty Things Jack D’Or is light bodied, super easy to drink, and at 6.4% ABV it is right around the norm for a saison. Like many saisons, Jack D’Or is great to pair with food – it is a go-to beer for me when I eat out. If you haven’t caught on by now this is one of my all-time favorite beers, highly recommended in every way. 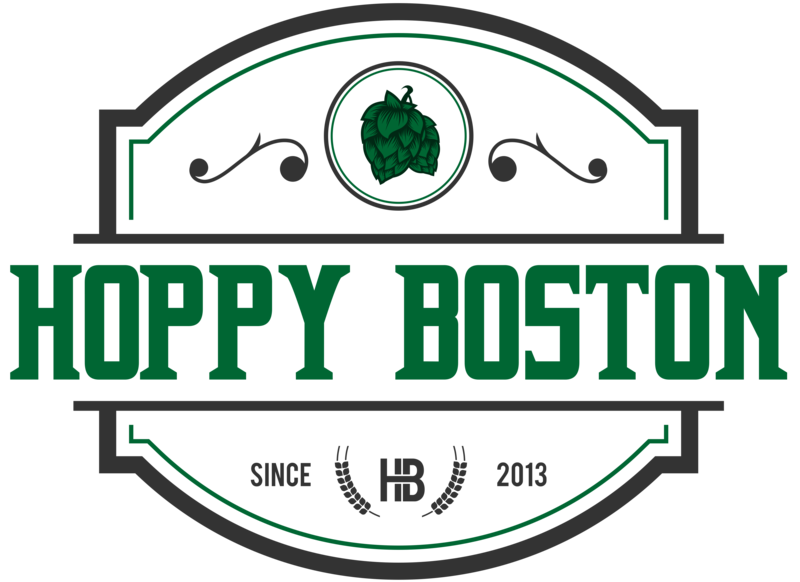 Hoppy Boston score: 5.0/5. Pretty Things Lovely Saint Winefride, Pretty Things Bocky Bier, Pretty Things/Naparbier There’s No Place Like There, Pretty Things Grampus, Pretty Things Barbapapa, Pretty Things Meadowlark, Pretty Things/Yeastie Boys Our Turn, Your Turn. Nice post – Pretty Things is one of my favorite local brews.